Ellis traces the history of the Egyptian royal family from the time of Noah through to Jesus, comparing Biblical and historical records. Nearly all of the biblical characters can be identified in the historical record -- all are pharaohs of Egypt or pharaohs in exile. The Bible depicts them as being simple shepherds, but in truth they were the Hyksos, the Shepherd Kings of Egypt. The Biblical story that has circulated around the globe is simply a history of one family, Abraham and his descendants. In the Bible he was known as Abram; in the historical record he is the pharaoh Maybra -- the most powerful man on Earth in his lifetime. By such simple sleight of hand, the pharaohs of Egypt have hidden their identity, but preserved their ancient history and bloodline. These kings were born of the gods; they were not only royal, they were also Sons of God. Well illustrated with 43 color plates. 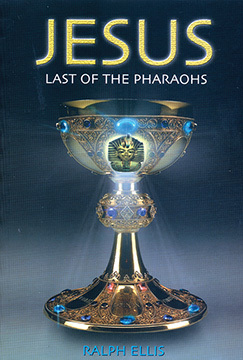 JESUS, LAST OF THE PHARAOHS by Ralph Ellis. 320 pages, 6x9 Paperback. Illustrated, Color Section, Bibliography.